Scarcity sparks “consumer competitive arousal,” the belief that a consumer situation is a competition in which there are potential “winners” and “losers.” Feelings of unfairness drove many shoppers to behave the way they did. Shopping and the retail-consumer relationship is expected to be an equitable exchange of a good for payment. Any violation of the exchange can evoke strong feelings. For the Black Friday faithful, the excitement begins on Thanksgiving, when eager shoppers line up outside big box and department stores for the chance to grab “doorbuster” sales and “prices slashed” merchandise when the doors open. Black Friday videos posted in recent years show shoppers shoving and shouting, with one temporary worker even trampled to death in 2008. What turns ordinary shoppers into dangerous mobs? Social scientists and psychologists are trying to find out. For a study published in The Clothing and Textiles Research Journal, she and her colleagues asked 189 Black Friday shoppers about their antics. Had they ever taken an item from another shopper’s cart, yelled at store workers, gotten into skirmishes with other customers or overturned racks of merchandise? Many of the participants, who were primarily female, white and well-educated, admitted to behaviors like trashing displays or yelling at employees. Dr. Lennon speculates that feelings of unfairness drove many of these shoppers to behave the way they did. Shopping and the retail-consumer relationship, she said, is expected to be an equitable exchange of a good for payment. 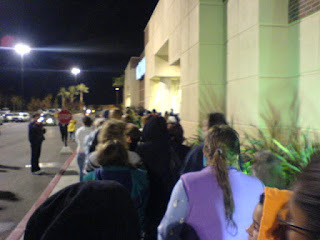 Any violation of the exchange can evoke strong feelings of inequality.When a store failed to properly stock advertised “doorbusters,” when sale prices weren’t honored, such as being denied an early bird discount at checkout even though they were in line before the sale expired, or when they failed to obtain an advertised item or failed to receive the discounts they anticipated, Black Friday shoppers were most likely to misbehave. In a follow-up study, Dr. Lennon surveyed 267 Black Friday shoppers and found that those who felt other customers were being “unpleasant” were more likely to feel the store was being unfair — and were more likely to become uncivil themselves. Examples of “unpleasant” behavior among fellow shoppers included line cutting, arguing with police or security officers, or acting rudely toward others. “The more they perceived the retailer situation to be inequitable, the more consumer misbehavior they displayed,” Dr. Lennon said. Perceptions of scarcity are also a driving factor in consumer misbehavior, said Bridget Nichols, an associate professor of marketing and sports business at Northern Kentucky University. When consumers feel a product is scarce, they value it more. And Black Friday is designed to offer limited amounts of products for a limited amount of time, thus heightening the sense of urgency, she said. In her research, Dr. Nichols has found that scarcity sparks “consumer competitive arousal,” the belief that a consumer situation is a competition in which there are potential “winners” and “losers.” Similar feelings arise at auctions, she said. “People want to feel they got a good deal,” she said. Competitive arousal can be ignited by a perception that a specific good, such as a popular toy or flat-screen television, is in limited supply and available for only a short period of time. Dr. Nichols found in her research, for example, that video game consumers had a heightened competitive arousal after viewing advertisements that described a new game as scarce or in limited supply. “With Black Friday, those stampedes are driven by the emotions that are drawn from scarcity and competition,” Dr. Nichols said. Competitive arousal can bring about another emotional driver: bonding. Dr. Nichols has extensively studied the former “running of the brides” at Filene’s Basement stores in Atlanta, Chicago and Washington, in which designer bridal gowns were drastically reduced in price. At the event, brides-to-be, joined by friends or family members, teamed up to grab as many dresses as possible for the bride to consider. trades with other shopping teams in which they misrepresented the value of the gown they gave away. A study in The Journal of Global Fashion Marketing found that Black Friday shoppers, perhaps not surprisingly, reported great pleasure in shopping. They were more attracted to the “hedonistic” atmosphere than those who opted to stay away from stores on that day. Indeed, Dr. Nichols, who was not involved in that study, noted that many Black Friday spectators are attracted to the excitement of the scene. For shoppers who are planning to join the Black Friday crowds, she advises being mindful of competitive emotions that can build when an item is perceived to be in short supply. “Whatever the ‘scarce’ thing is, it will likely be in abundance come January,” Dr. Nichols said, noting that Hatchimals, the must-have toy of 2016, were in short supply before the holidays but became widely available just a few weeks later. “Just remind yourself that no special deal is worth getting hurt over or hurting someone else,” she said.